Accurate path following is an important mobile robot research topic. In many cases, radio controlled robots are not able to work properly due to the lack of a good communication system. This problem can cause many difficulties when robot positioning is regarded. In this context, gaining automatic abilities becomes essential to achieving a major number of mission successes. This chapter presents a suitable control methodology used to achieve accurate path following and positioning of nonholonomic robots by using PID controllers. 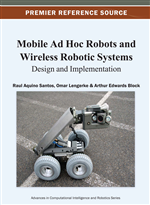 An important goal is to present the obtained experimental results by using the available mobile robot platform that consists of a differential driven one. In mathematics and physics, a nonholonomic system is a system in which a return to the original internal configuration does not guarantee return to the original system position (Bloch, 2003). In other words, unlike with a holonomic system, the outcome of a nonholonomic system is path-dependent, and the number of generalized coordinates required to represent a system completely is more than its control degrees of freedom. In this case the WMR has two control inputs, which correspond to the voltages applied to each motor wheel and three degrees of freedom for generalized coordinates (position coordinates x, y, and heading orientation,θ). Thus, return to the internal configuration does not guarantee return to the original system position. Cars and bicycles are other examples of nonholonomic systems. From a control science point of view, accuracy and performance of WMR trajectory tracking are subject to nonholonomic constraints, and consequently it is usually difficult to achieve stabilized tracking of trajectory points using linear feedback laws (Brockett, 1983). In the research, results presented by Hauser and Hindman (1995), demonstrate through Lyapunov stability theory that asymptotic stability exists in the control system with respect to the desired trajectory. In the case considered in Hauser and Hindman (1995), where trajectory tracking is performed using different linear models, the Euclidean distance between the robot and the desired trajectory can be used as a potential function. Such functions are CLF (Control Lyapunov Function), and consequently asymptotic stable with respect to the desired trajectory can be achieved. Path-following stabilization of nonholonomic systems can be achieved using time varying, discontinuous, or hybrid feedback laws. The time-varying smooth state feedback asymptotically stabilizes a mobile robot to a point (Coron, 1991). Coron showed that it is possible to generate time-periodic feedbacks, which assure the finite-time convergence. Feedback stabilization by using homogeneous structures has been proposed in Dayawansa et al. (1995). The homogeneous control for autonomous systems has depicted homogeneous Lyapunov function results (Rosier, 1992; Aicardi, et al., 1995). Homogeneous time periodic control laws allow, in nonholonomic WMR, use feedback that gives the finite time convergence (M’Closkey & Murray, 1997). An alternative to time-dependent smooth controllers are discontinuous or piecewise smooth controllers (Bloch, et al., 1990). The stabilization about an arbitrary point in the state space is presented in Canudas de Wit and Sørdalen (1991). The use of hybrid techniques considering discontinuous and time variant control laws has been the focus of efforts by many researchers. These controllers operate by switching at discrete time instants between various time-periodic feedback functions (Kolmanovky & McClamroch, 1995). Hence, the use of discontinuous control law with time variant sinusoids is proposed in Kolmanovky and McClamroch (1996). The use of force and torque as useful inputs for changing the control law is proposed in Aguiar and Pascoal (2000).The placement of integrators relative to the nonholonomic integrator has shown leading to a class of second order systems which can be distinguished by their controllability properties. Furthermore, studies of cascade dynamic system to the nonholonomic integrator lead to optimal solutions by using calculus of variations (Struemper & Krishnaprasad, 1997).